Get a Buy One Get One FREE Drink at Caribou Coffee on October 31, 2013. Kids in costume on Halloween Eat FREE at McAlister’s! Just check you local store to be sure they are participating. LEGO Stores - FREE LEGO Monster Fighters The Monster Key Chain on October 31st -on Halloween dressed in your Halloween costume! 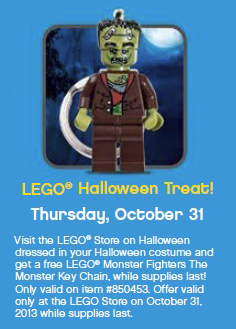 LEGO Stores are offering a FREE LEGO Monster Fighters The Monster Key Chain on October 31st when you visit the LEGO Store on Halloween dressed in your Halloween costume! Visit the LEGO® Store on Halloween dressed in your Halloween costume and get a free LEGO® Monster Fighters The Monster Key Chain, while supplies last! Only valid on item #850453. Offer valid only at the LEGO Store on October 31, 2013 while supplies last. CVS has Kotex U Barely There Thin Minces Liners (18 ct) for $1.49and there is a $2 off ANY Package of U by Kotex Products CVS Store Coupon that will make these FREE! FREE Doughnut at Krispy -on Halloween (October 31st)! FREE Doughnut at Krispy Kreme when you wear your costume to any participating US or Canadian Krispy Kreme shops near you on Halloween (October 31st)! Reminder: IHOP is offering FREE Scary Face Halloween Pancake Today (October 31st) from 7:00 a.m. to 10:00 p.m. for kids 12 and under.